Naoki Urasawa is one of the most prolific mangaka in Japan and his manga have won two Eisner Awards (specifically “Best US Edition of International Material – Asia” in 2011 and 2013 for 20th Century Boys). The award puts him alongside greats such as Kazuo Koike/Goseki Kojima, Katsuhiro Otomo, Shigeru Mizuki, and Osamu Tezuka. And the accolades for Monster aren’t just from the west. Monster has won the Excellence Prize in the Japan Media Arts Festival in 1997, the Grand Prize of the Tezuka Osamu Cultural Prize, and won the General category in the 46th Shogakukan Manga Award. But the manga stands on its own and hardly needs accolades to prove to anyone of how good it is. Unfortunately, the manga and anime haven’t done any groundbreaking numbers here in the US and the anime’s license has lapsed (which was stated by Viz’s own Charlene Ingram on ANNCast on July 17). Fortunately, rumors of a new HBO series helmed by Pacific Rim and Pan’s Labyrinth director Guillermo del Toro (comic book fans may know him as the director for Blade II and the Hellboy franchise) have kickstarted the manga back to life and Monster—along with Rumiko Takahashi’s Ranma ½—are being reprinted in 2-in-1 volumes. Set in 1986 (before the Berlin Wall was taken down), Dr. Kenzo Tenma is faced with a cruel reality by the director of the hospital (and future father-in-law): “People’s lives aren’t created equal.” After he saves a boy over the mayor—who was about to give the hospital a big increase in funds—Tenma finds himself at the bottom rung. “No life is worth more or less than another!” Tenma emphatically yells out to the boy he saved, still asleep after surgery. While the director says, “Our priority is to progress as medical scholars before saving lives,’ Tenma responds “A doctor’s priority is always to save lives,” again, to the boy. Tenma’s entire life starts to deteriorate from this moment of future Head of Neurosurgery to mere doctor. The next part, nine years later, is after the Wall was taken down. Here, the boy Tenma saved is found to be a serial killer, hiring out thugs to do the heavy lifting. The Berlin Wall part doesn’t matter in the first volume (other than the boy escaped with his parents to West Germany), but Wikipedia tells me that it’ll matter later. I won’t divulge why, as the first volume doesn’t get to it. Urasawa has been lauded as a master storyteller, but I haven’t read anything of his prior to Monster. Monster doesn’t disappoint and its intrigue, I’m sure, will last throughout the 18 volumes it’s collected into. His mystery storytelling is reminiscent of David Lynch’s films and they’re just as exciting. Most of this first volume is setup, but everything matters. His relationship with fiancée Eva, the daughter of the director, is brought up later. Every character that appears thus far serves a role and the one that’s (seemingly) on his side, Dr. Becker, plays perfectly with Tenma’s character. The others, from Heinemann, Oppenheim, and Boyer, serve as perfect foils to Tenma’s emotional state in their respective scenes. If nothing else, Urasawa is a master character builder, because even the short-lived characters have their own depth to them. 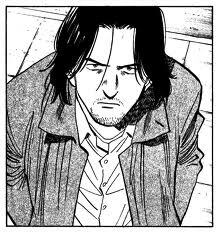 Of course, Urasawa is more than that; he wouldn’t be considered one of the greats if he wasn’t. The first few chapters are an excellent deconstruction of the hospital system we go through right now in the US (I’m not sure how the hospital system works in Japan or Germany, though—but the story works as a deconstruction of the US system). Doctors are told that their priority is the publicity and funding for the hospital, and not the patient’s life. While this is, of course, not true for all hospitals, it can be a cruel reality in both fiction and real life. This is further exemplified when Tenma finds out that the boy he saved, the boy whose life was equal to the harmless mayor, is found to be a serial killer. What he thought was the right choice at the time might not, in a utilitarian sense, actually have been right at all and Tenma is now forced to face that reality he once denied, which is people’s lives aren’t created equal. They certainly aren’t, and Tenma chose the wrong life. But that’s not all. Tenma is told by Becker that hard work won’t bring you a promotion, but politics will. After the death of Heinemann, Oppenheim, and Boyer, Tenma gets the promotion he deserved, to Head of Surgery. This does three important things: Gives Tenma a motive in the eyes of the detectives trying to solve this case, proves that hard work can indeed pay off, and brings into question Becker’s work ethic. Becker, in one scene, perhaps goes from sympathetic character to lazy doctor. The artwork is exemplary, only eclipsed by Miyazaki’s Nausicaa manga and Kojima’s Lone Wolf and Cub from all the manga I’ve read. The characters are a little cartoon-y, but they work in the context and look stone serious when needed. The backgrounds aren’t lacking, either. Some paintings in the scenes are actually painted in within the one panel they occupy, and only to enhance the mood of the scene, albeit sparsely. What’s impressive is the imagery of the medical procedures. From the dialogue to the drawings, you can tell that Urasawa has done his research (and he isn’t a medical doctor like Dr. Osamu Tezuka; Urasawa graduated with an economics degree from Meisei University). Monster is a title that I’ve been wanting to get my hands on, especially since the announcement of del Toro and HBO’s live action adaptation. I finally found volume one, and only volume one, at my local Half Price Books. It has a perfect mixture of character development, artwork, and storytelling. I’m at the edge of my seat wanting to read more of Monster, but having to wait for new volumes to come out. As I said, Monster has been woefully out of print from Viz. But also aforementioned is the new reprint of Monster in 2-in-1 volumes. It’s going to go by the name “Monster: The Perfect Edition” and volumes will start being printed in July 2014, with a new one due out every three months. Don’t hold your breath on the del Toro adaptation, though. Be excited once the man gets behind the camera. Editor’s note: Listen to Tim and Natalie discuss the entire series in DCP episode 291! No user commented in " Urasawa’s classic “Monster” to return to print "